ADAPTABLE & DEPENDABLE: Loaded with intuitive safety features, it adapts to angled, wide, and/or irregular openings and landings to provide you with a customized baby gate for almost any situation. QUICK & EASY OPERATION: Hardware mounted for stability, this 3-paneled gate is easy to arrange & install based upon your needs & preferences. Easy to use with simple, reliable, one-handed operation. SMART STAY-OPEN: Doing laundry, entertaining guests, making dinner? With the convenience of Smart Stay-Open, the Adapta-Gate can be made to stay open whenever you want it. AUTO-CLOSE TECHNOLOGY: Convenience of Auto-Close, which ensures constant and reliable safety. OPENING OPTIONS: Swings open in both directions for ease of use. However, it can be adjusted to open in only one direction, which is especially important when positioned at the top of stairs. EZY-CHECK INDICATOR: EZY-Check indicator will help you identify your gate is securely locked with just a quick glance. It also helps indicate your gate is properly installed. Great for pets too. Child proof your home in style with the Deco Bronze Extra Tall Walk-Thru Gate. This attractive bronze metal gate is adjustable to accommodate most door openings. Hardware is included for extra secure mounting or pressure mount for a secure installation that doesn't leave marks on the wall. 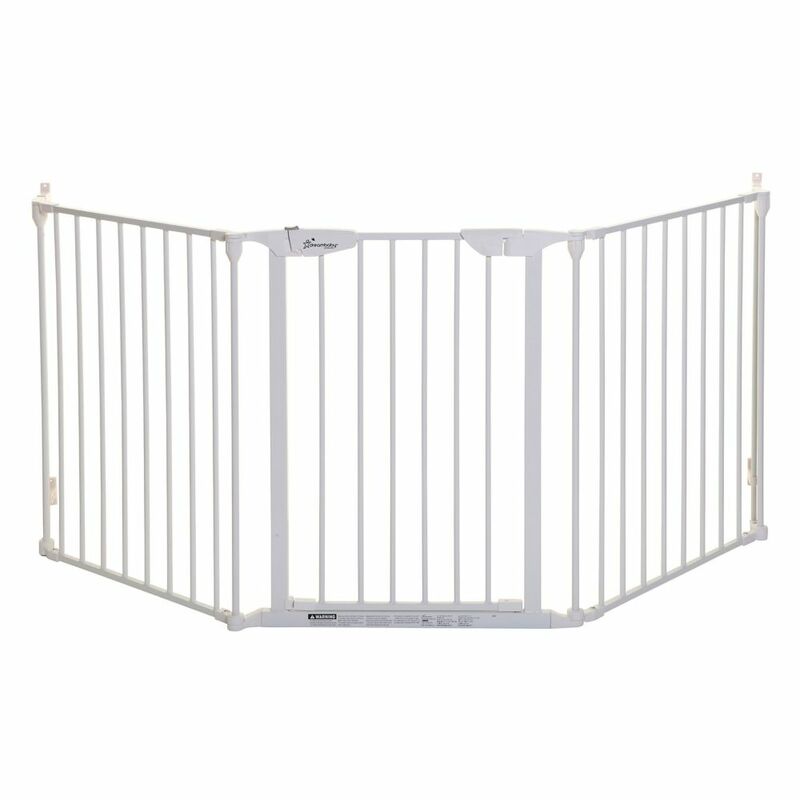 The Newport Adapta-Gate - White The Dreambaby Newport Adapta-Gate combines safety and convenience in one fantastic package. Hardware mounted for stability, it incorporates three hinged panels that can accommodate straight, angled, wide, and/or irregular openings and landings. Unlike many other gates that only span a doorway, it creates safe and roomy landings at the top or bottom of staircases and can also be used across wider openings. It's easy to arrange and install. Our gate allows for one-handed operation, has a convenient automatic close-and-lock feature, and comes with an EZY-Check indicator so you know when the gate is securely closed. Stay-Open feature, which is perfect for when you need to move freely through. The Dreambaby Newport Adapta Gate swings open in both directions, but you can limit it to open in only one direction. This feature is especially important when used at the top of stairs. Hinged panels can accommodate openings of 33.5 inch - 79 inch across. Gate measures 29 inch high.